Let's disclose what happens behind that click on the "buy" button. The most important metrics for stock investments — What are the most famous stock metrics and how to translate them into something useful to humans. Welcome back to the third chapter of my adventures in stock markets. This time I want to take a look at the stock exchanges, how they work and how one can trade stocks in the market. As always, I'd love to start with some basic questions. Whenever you wish to buy or sell a stock you have to rely on a stock exchange. A stock exchange is a place where buyers get in touch with sellers (and vice versa) to buy and sell stocks. If you wish to trade a stock with someone else, you need a stock exchange and its services. Stock exchanges are spread all over the world, and the majority of nations has one or more stock exchanges. Let me name a few of them: New York Stock Exchange (NYSE) and Nasdaq, both of the United States; London Stock Exchange Group, British-based and owner of Borsa Italiana, the Italian stock exchange; Japan Exchange Group of Japan; Shanghai Stock Exchange of China. The list goes on, as you may see here. Few countries lack of a central stock exchange. 1. The floor of the New York Stock Exchange. Author: Kevin Hutchinson, released under Creative Commons license. 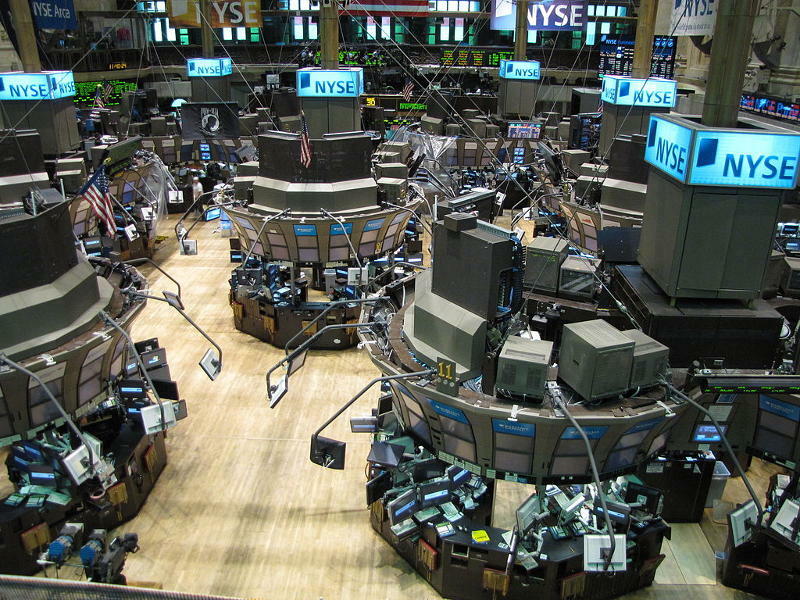 A stock exchange is a big room filled with computers and people. In those buildings you may find the so-called floor, a place where trading activities are conducted. It's an actual space where traders buy or sell assets, often through shouting and hand signaling. However that's the traditional way of trading goods. Today most exchanges use electronic trading systems to reduce the costs and to improve execution speed; today the floor is filled with computers to place orders, as displayed in the picture 1. above. It's very unlikely (maybe even impossible) that a common investor would walk into a stock exchange and start trading with the other fellows in there. Those places are meant for professionals, as we will see later. If you want to buy or sell stocks you have to rely on several middlemen that trade for you on your behalf. Stock exchanges are said to be secondary markets, because you are trading stocks that have been created in a previous step — the primary market, namely when the companies issue the stock for the first time in their lives (the famous IPO process). In a primary market you buy stocks directly from the company, while in a secondary market you buy/trade them with other people, completely unrelated with the company who issued the stocks initially. Why so many stock exchanges? Stock exchanges are in fact private companies that profit from other companies being listed on their databases. Most often times stock exchanges follow the usual market rules and compete with other exchanges. This could be a reason for the existence of many of them in the world. Another cause is the currency. Generally, an exchange will support transactions only in its local currency. Since many countries have their own variety, you will need at least the same number of stock exchanges to support local trading. Securities trading always strives to be a clean and frictionless process: adding cross-currency translation to the mix would just complicate things. We know from the first chapter of this series that a company chooses in which stock exchange to trade its stocks once the IPO is over. To be publicly traded, every stock must list on an exchange where buyers and sellers can meet. For example, Apple is listed on Nasdaq, while McDonald's Corporation on the NYSE. It's kind of unusual to find companies that are listed on multiples exchanges. Why, for example, Apple decided to get listed on Nasdaq instead of NYSE? I don't know, of course. In general, stock exchanges requires a fee for a company to be listed, and each stock exchange has its own price. Also, a company must meet the stock exchange's standards in order to become listed — for example NYSE is known to be oriented to well established companies, while Nasdaq tends to attract smaller and growth-oriented companies. The table below reports some noteworthy differences between the two most famous stock exchanges in the world. You may notice how the NYSE is more demanding in terms of fees and company's value. Maximum yearly fee of $500,000. Yearly fee of around $27,000. Entry fee up to $250,000. Entry fee from $50,000 to $75,000. The company must have issued a minimum of 1,100,000 shares to 400 shareholders at least. The company must have publicly traded at least 1,250,000 shares, with a minimum bid price of $4. Stock markets can be grouped into two main clusters: dealer markets and auction markets. What's the difference? The NYSE is an example of an auction market. In an auction market people who want to trade don't buy from/sell to one another directly. They do it through one specialist, a guy (or a firm), member of the stock exchange, that acts as the gatekeeper for incoming orders to buy and sell. Their main function is to process the orders by matching buyers with sellers and make sure the transactions flow smoothly. They also provide an interface for other entities who, in turn, provide and interface for the private investor, as we will see later. Despite their importance, the number of specialists has declined, thanks to electronic trading. The Nasdaq is an example of a dealer market. A dealer market is made up by many professionals (or firms) called dealers, who buy and sell stuff with their own money. In a dealer market people trade through dealers. Unlike the monolithic specialist in the auction market, dealers in dealer markets are numerous. Their role is basically the same of a specialist, but they trade for their own business and don't belong to the stock exchange. Unlike a specialist they have customers, because they are actual companies, so that they can provide support to their investor clients. Whether they work in a dealer market or in an auction market, those figures are also known as market makers: entities that stand ready to buy and sell a particular stock on a continuous basis. Their daily job is to constantly handle a very large number of securities ready to be traded. They ensure market transactions are as smooth and continuous as possible. You can think of them as pools, or buffers if you like the IT analogy; thanks to their massive amount of securities they generate liquidity, that is leveling potential huge gap prices, providing the ability to trade any number of stocks anytime. They are said to "make the market" for this very reason. Later on we will see how they operate in detail. A stock exchange is like a big warehouse in which people buy and sell stocks. Each buy order must match to a sell order, and vice versa; the operation is done through computers or humans. As said before, some exchanges work like on an actual trading floor (physical), and others match buyers to sellers electronically (virtual); some others are dealer markets, other auction markets. Anyway, every stock market is based on two important concepts: the supply and demand rule and the bid/ask prices. A stock market follows the supply and demand rules of any other market on this planet. The abundance of shares (supply) is balanced by how much people want to pay for them (demand). Those market forces make the stock prices change every day. If more people want to buy a stock (demand) than sell it (supply), then the price moves up. Conversely, if more people want to sell a stock rather than buy it, there would be greater supply than demand: the price would fall. The supply and demand rule also answers the mythical question on what actually drives stock prices. Except for the price defined during the IPO process, everything is ruled by traders' choices. In the stock market buyers and sellers define what price they are willing to buy or sell their items. Buyers define the bid price and the bid size, namely how much they are willing to pay and the maximum number of stocks they are willing to buy. Sellers define the ask price and the ask size, namely how much they are willing to earn and the maximum number of stocks they are willing to sell. Suppose we are in the middle of trading session of some Disney shares. A string like Bid: 100.10 x200 means that there are potential buyers for up to 200 Disney shares at $100.10. But that's only the highest priced currently bid: there are many others potential buyers in line behind with lower bid prices. So that bid you're seeing is actually the best bid price at that moment. Conversely, a string like Ask: 100.20 x150 means that there are potential sellers for up to 150 Disney shares at $100.20. That's only the lowest price currently asked: there are many others potential sellers in line behind with higher ask prices. The ask you're seeing is actually the best ask price at that moment. A transaction takes place when either a potential buyer is willing to pay the asking price, or a potential seller is willing to accept the bid price, or else they meet in the middle if both buyers and sellers change their orders. Then the price of that last trade becomes the current stock price, the big one you will see in any stock chart out there. Bid and ask price values offer a useful insight of what the market thinks about the company. In general, the smaller the difference between the bid and ask price (i.e. the bid-ask spread), the more actively traded the security. The most actively traded stocks show a bid-ask spread of few pennies, but it tends to rise during times of market trouble: traders don't want to pay above a certain level, and sellers don't want to accept low prices. Taking care of the bid-ask spread can save you more than one headache if you are trading thinly traded stocks, as we well see in a minute. Also the bid-ask size can be useful: a larger ask size than bid size means that at that moment, there are more sellers than buyers and thus a downward pressure on the stock's price. Or vice versa. There are times when people buy when nobody is queuing to sell, and time when they sell when nobody is queuing to buy. How is that possible? This is where market makers come in. Their job is to make bids and offers for their accounts in the absence of public buy or sell orders; that ensures smooth and continuous market transactions. When a trader buys something nobody is queuing to sell, market makers sell that stock to the trader from their own portfolio. Conversely when a trader sells something nobody is queuing to buy, market makers buy that stock from that trader and adds it to their own portfolio. In doing so, market orders are continuously moving, eradicating sudden surges and ditches due to buying and selling inequality. Imagine a market without market makers, where Company XYZ has just announced fantastic earnings. You want to buy XYZ stocks but investors who are already holding XYZ stocks are not selling. You want to attract a seller, so you begin to bid higher and higher for until at last, a seller is moved to selling the stock. That way the price has skyrocketed. Consider again a sudden bad news released from XYZ company: everyone is rushing to sell XYZ stocks. You'd like to sell it too, but nobody is buying. In order to attract a buyer, you start to push the price lower and lower until at last, the price bottoms out worthless. Suppose that today you want to become an Disney shareholder by buying N shares of that company: you know you can't just walk into your favorite stock exchange and start trading on the floor. This activity is carried out by brokers, the interface between you and the whole market. We encountered this figure in chapter 1: whether they are individuals or complex brokerage firms, a broker's task is to place investment orders on your behalf, for a fee. They are licensed to trade stocks through the exchange, both on the trading floor or by phone/electronically. stop order — you purchase the shares when they are greater than or equal to (≥) a specified price. Except for the inverted logic, they work exactly as a limit order. Now that the order has been placed, you are basically done with it. But that's just the tip of the iceberg; between your click on the "buy" button and the actual stock in your basket, dozens of hidden operations take place. Now the broker has to choose the best way to execute the trade. In general they face two main routes: principal trading or agency trading. Many brokers not only act as middlemen, they also hold securities like you do in order to make money. This is called principal trading: they trade for themselves. When you ask them for those N shares of Disney, they might take a look in their pool of securities and check if they have what you want. If so, the brokers will fetch from their inventory those N shares and sell them to you. There's another obvious yet cool option: agency trading. Here brokers dive into the sea of stock exchanges to buy what you're asking for. This is where the figure of the market maker comes in, that acts as an interface between the broker and the real stock market. At this point the broker fills that order by interacting with the market makers, engaging the trader-vs-market-makers dance we have seen before. Anyway brokers are obligated by law to give each of their investors the best possible order execution, whether they select the stocks from their bag or from stock exchanges. This is not just a fancy marketing promise: it's a SEC rule in the U.S.